SABR sell Intermec Computers. Talk to us to find out which model Intermec Mobile Handheld, Fixed or Vehicle Mount Computer can cater for your needs. Let us help you make the most economical choices when deciding which Intermec Computer will fit your barcoding needs. Intermec fixed and vehicle mount computers include the latest radio technologies including industry standard IEEE® 802.11x, Cisco® certified compatibility, and support for Bluetooth® scanning and peripherals, enabling either wired or wireless operation. They are ideal for the demands of mobile warehouse and inventory-control applications common to material handling equipment and industrial vehicles such as forklifts and hostlers. 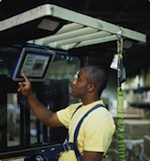 Their compact form factor and rugged design also make these computers ideal for fixed mount applications such as cross docking, manufacturing work stations, shop floor, and other warehouse and distribution environments. Intermec's rugged handheld computers are built for the task at hand, combining the advantage of consumer PDAs and high-end industrial mobile computers into a single rugged package. Like PDAs, Intermec systems are small and lightweight, yet they provide targeted functionality, a tactical keypad and enhanced connectivity including industry standard IEEE® 802.11x, Cisco® compatibility and Bluetooth®.